On Tuesday, students from the IT Academy at El Cerrito High School took part in a special Big Data Study Trip hosted at Berkeley Lab and held by a partnership of Workforce Development and Education (WDE), EESA, NERSC and CRD. Working with water quality data collected by Michelle Newcomer of the Climate and Ecosystem Sciences Division (CESD) and staged at NERSC, the students plotted characteristics and mapped patterns, then offered their own ideas for how to collect and analyze data from a contaminated site on San Pablo Bay. They also toured Wang Hall and the NERSC machine room and ate lunch with scientists and technical staff at Berkeley Lab. The response to this first-time workshop was enthusiastic. “This was the best field trip we’ve had all year,” said Jim Lindsay, lead teacher for the IT Academy. 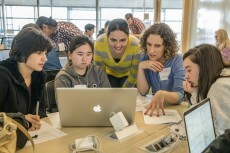 Led by Mara Lockowandt of WDE, CS staffers Hans Johansen (CRD), Deborah Bard (NERSC), Burlen Loring (CRD) and Jon Bashor (CS) planned the program and worked with students. 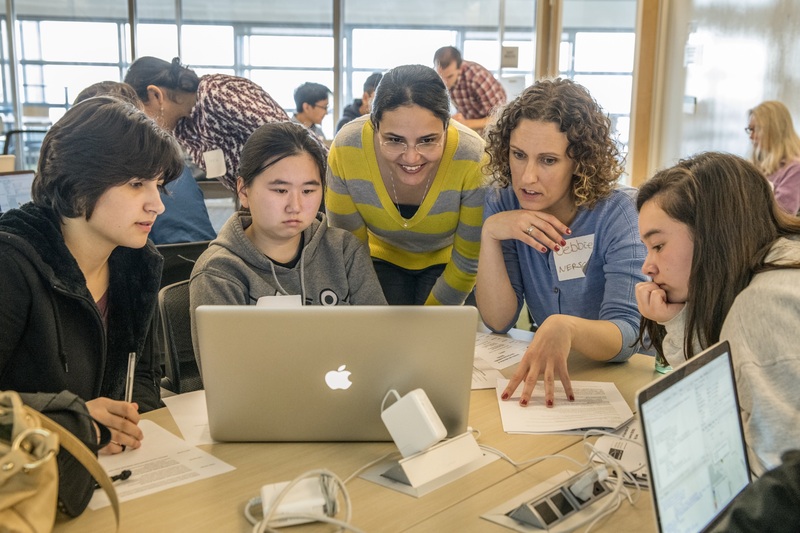 Also working with students during the event were Annette Greiner and Brian Friesen of NERSC, Hadia Ahmed of CRD, Robert Johnson of on-site Cray staff, as well as researchers from the Advanced Light Source and Energy Geosciences. Bashor, Kathy Kincade, Linda Vu and Margie Wylie, all of CS communications, led machine room tours with the assistance of NERSC’s Yomi Kujore and Yulok Lam.